Lebanon’s economy needs urgent “surgery” or it could collapse, Prime Minister Saad al-Hariri said on Sunday, though he also tried to reassure foreign donors that politicians remained fully united behind reforms agreed with them last year. After nine months of wrangling over cabinet portfolios, Lebanon’s politicians finally formed a government 10 days ago. The heavily-indebted country has said it will enact long-overdue reforms to avoid a worsening of economic, financial and social conditions. 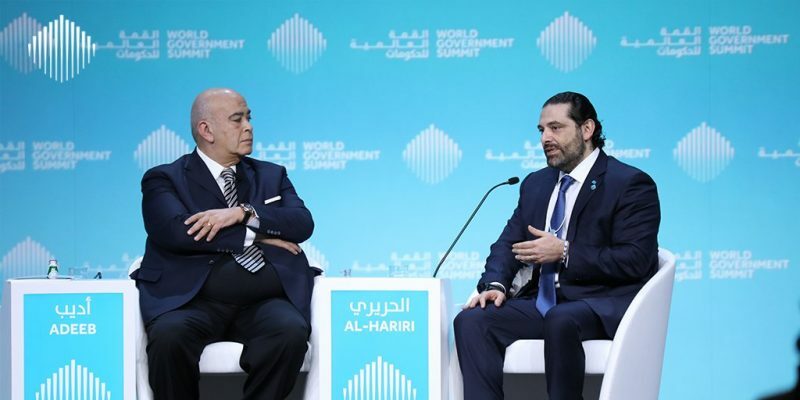 “Today in Lebanon we don’t have time for luxury in politics because our economy could be subjected to collapse, if we do not carry out this surgery quickly and with (political) unanimity,” he told the World Government Summit in Dubai. International donor institutions and foreign governments want to see the new government enact reforms before releasing some $11bn in financial assistance pledged at a Paris conference last April called “Cedre”. “I tell you there is political unanimity in Lebanon on all the reforms that happened at Cedre and there is political consensus to fight corruption,” he said. While in the United Arab Emirates, Hariri met Dubai’s ruler Sheikh Mohammed bin Rashid Al Maktoum and other Emirati officials. Separately, Hariri met the International Monetary Fund’s managing director Christine Lagarde.